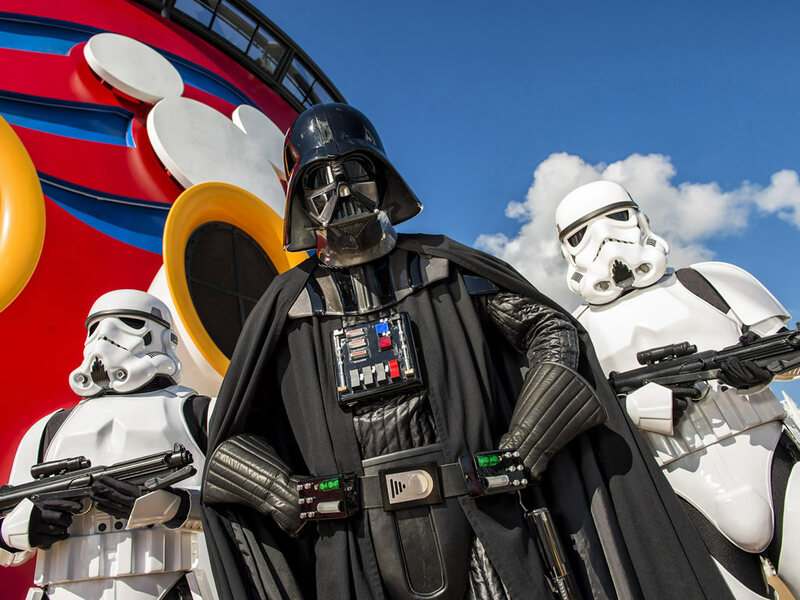 Some parents might be wishing the force was with them as Disney Cruise Line is to offer a selection of Frozen and Star Wars themed cruises featuring an entire day dedicated to each topic. These will be incredibly popular sailings as the following for both movies is colossal. So what can parents and massive Frozen and Star Wars fans expect from these cruises? The first news that broke was that Disney Cruise Line was to offer a selection of Frozen themed events starting in Summer 2015 on selected Disney Magic and Disney Wonder sailings to Europe and Alaska. Guests will wake up on a special day to find their cruise ship has become a winter wonderland - the atrium lobby, for instance, will have sparkling icicles adorning the grand staircase, resembling Queen Elsa's grand mountain-top ice palace. The day will culminate with a family-friendly interactive deck party entitled "Freezing the Night Away with Anna, Elsa and Friends". The upper decks of the ship will be decorated with giant snowflakes, icicles and snow-covered rocks to give an extra magical touch to this winter wonderland event. Anna and Kristoff’s beloved companions, Sven, the trolls and Olaf, will make virtual appearances at the part. Sven will engage the crowd in reindeer games like "Sven Says" and the "Troll Stroll," while Olaf will lead a sing-along to his signature song, "In Summer". Elsa will then arrive with a snowy gust of wind, calling on guests to sing "Let it Go" with her as she conjures up a wintry spectacle to cool things down for Olaf. In true Disney fashion, Elsa will unleash her magic, sending a chill through everyone as the powerful Academy Award-winning song will echo from the ship. The evening will conclude with more family dancing on the pool deck, followed by fun just for adults in the nightclub featuring dance performances and frozen speciality drinks. A new production show will début in the Walt Disney Theatre onboard the Disney Magic. In this Disney Cruise Line original production called "Disney Dreams … An Enchanted Classic" Anna, Elsa and Olaf will join the line-up of Disney characters who together teach a young girl the power of her dreams. New scenes featuring the Frozen characters will include renditions of the film's three most popular songs: "Let it Go," "For the First Time in Forever" and "In Summer". Expect a heartfelt, humorous and memorable tribute to the Frozen film together with magical special effects including a snowfall throughout the theatre! 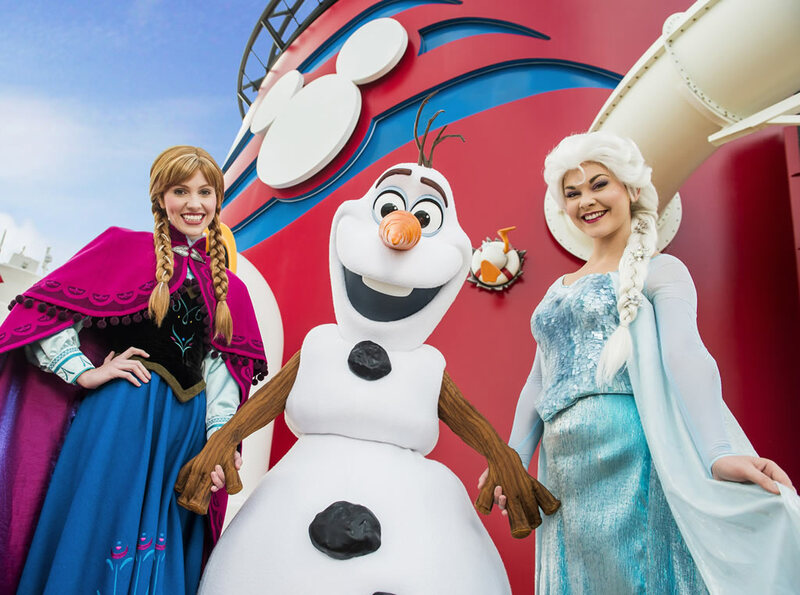 Frozen-themed meet-and-greets will take place on all Disney Cruise Line ships (Disney Fantasy, Disney Dream, Disney Wonder and Disney Magic) as of this summer. Loveable Olaf will be giving hugs along with Anna and Elsa. Children and families will have the opportunity to meet and take photographs with their favourite Frozen friends. The magic of Frozen won't be confined solely to the cruise ships as guests sailing to Norway on Disney Magic will be able to experience a selection of Frozen-inspired shore excursions. In the Frozen film, Norway is the land that inspired Arendelle so offering a range of inspirational shore excursions makes sense. One signature adventure created exclusively for Disney Cruise Line ashore in Ålesund, Norway will immerse guests in the splendour and charm of Norway, with the help of Anna and Elsa, in an enchanting storybook village. Other shore excursions will take Disney Cruise Line guests to discover the breathtaking natural wonders, stunning architecture and rich Scandinavian culture depicted in the film. For passengers sailing to Castaway Cay on Caribbean itineraries fear not as Olaf will be helping everyone keep cool thanks to Olaf’s Summertime Freeze bar. This venue near the Pelican Point tram stop by Castaway Cay Family Beach will open in summer 2015 and will serve non-alcoholic speciality frozen drinks in souvenir cups. Expect Frozen-themed names of drinks including "Olaf’s Flurry Freeze", "Sven’s Carrot Delight" and "Warm Hugs". In 2016 Star Wars fans will rejoice as the Star Wars Day at Sea experience will be added to Disney Fantasy for eight special sailings in the Western Caribbean. As with the Frozen-themed cruises the Star Wars Day at Sea cruises will feature one entire day devoted to the franchise. Darth Vader, Chewbacca, Boba Fett, Stormtroopers and other characters from across the Star Wars galaxy will be onboard for scheduled meet-and-greets. They will also be roaming on deck and elsewhere around the ship. Guests are encouraged to dress up in costumes. A shipboard version of the popular Jedi Training Academy experience will invite young Jedi hopefuls (otherwise known as "Padawans") to learn lightsaber moves from a Jedi Master. They will then use the Force and face off in a final test against the evil Darth Vader! Kids and families will enjoy friendly competition during Star Wars trivia games, covering fun facts from the film and television sagas. Guests will be able to watch the first six Star Wars films and follow Darth Vader, Obi-Wan Kenobi, Luke and Leia along their epic journey. Passengers can watch episodes of the new Disney XD animated series Star Wars Rebels onboard. Limited merchandise will be available on the day as will be unique food and beverage offerings. The day will culminate in a Star Wars deck party which will be an exciting evening filled with music, dancing and games. The Star Wars characters will converge on the deck stage for a celebration of the Star Wars saga in a show featuring both special effects and plenty of guest participation. The finale will be a spectacular display of themed pyrotechnics, lighting, sound effects and lasers. In the evening the adults night club will be reminiscent of the famous Mos Eisley cantina scene. Characters and cantina music will set the mood as Star Wars-themed speciality cocktails will be served. On each of the special Star Wars-themed sailings, a variety of celebrities and insiders from the Star Wars films will share their experiences, meet fans, and sign autographs. Exact details are unknown at this stage. Star Wars Day at Sea will be on Disney Fantasy cruises departing from Port Canaveral on 9th January, 23rd January, 6th February, 20th February, 5th March, 19th March, 2nd April and 16th April 2016. All of these sailings are on a seven-night Western Caribbean itinerary which will include calls to Cozumel (Mexico), Grand Cayman (Cayman Islands) and a call to Castaway Cay - Disney’s private island in the Bahamas. Unfortunately, the 30th April 2016 itinerary does not make this list. Had Disney Cruise Line tinkered with the planning, a themed cruise could have coincided with May the 4th (otherwise known as Star Wars day). Admittedly, on this particular itinerary, the ship is due to call into Falmouth (Jamaica) on the 4th, perhaps not ideal for a day-long event. Whether Disney chooses to extend this programme of themed cruises is anyone's guess. I believe it has a future so long as the initial runs prove popular. Given the success of the Star Wars franchise and the Frozen film, I sincerely think this is not the last we see of Disney movie themed cruises. Will you be heading onto a Star Wars or Frozen themed cruise? Is there another Disney film you would like to see used as a theme? Leave a comment below.